Is NASCAR testing itself to death? Burned out. Fatigued. Divorced. Walking zombies. Sound like a Winston Cup crewmember? It is. The core people who make NASCAR race cars run so the fans can enjoy the spectacle are the very ones who have so little to say about the demands imposed on them by the demanding yearlong grind of Winston Cup racing. And to make matters worse, next year the NASCAR Winston Cup teams will face a more grueling 38-race schedule (36 plus the non-point fan favorites Bud Shootout and the Winston). New races have been added for the Chicagoland Speedway in Joliet, Illinois and Kansas Speedway in Kansas City. Have the crewmembers reached the end of their rope? As in any occupation where fatigue can lead to mistakes, will a fatigued crewmember make a mistake that will cost a driver his life? 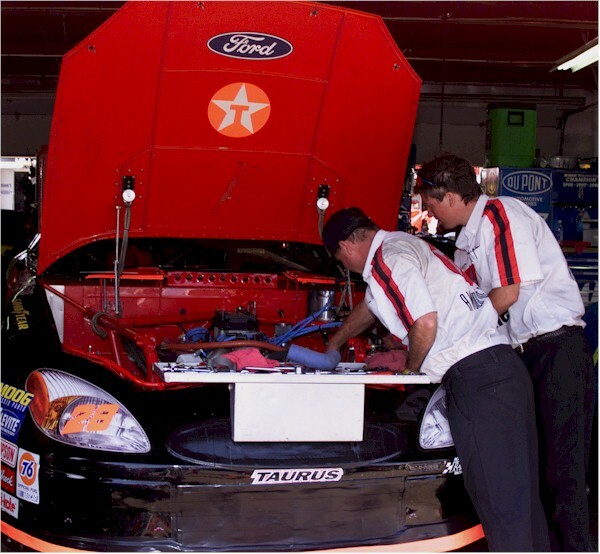 Did fatigue cause the stuck throttles on Adam Petty and Kenny Irwin Jr's cars? Probably not in this case, but I'm certain that some deaths over the years can be contributed to fatigue and whose to say it could not happen in the future. As the Winston Cup teams trek from venue to venue, test dates are scattered across the Winston Cup schedule in a varied array of dates and locations. NASCAR rules allow every team 7 test sessions at different Winston Cup venues, three of which are mandated to be at Daytona, Charlotte and Indianapolis. The teams are free to choose the other Winston Cup venues at which to test. 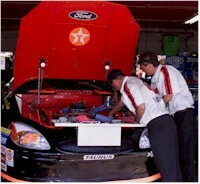 A typical NASCAR test session is 2 to 3 days. They also are allowed unlimited testing dates at facilities not visited by the Winston Cup tour. With breaks in the schedule for Easter, Mothers Day and possibly one open weekend during the summer, the Winston Cup teams will be on the road for a span of 41 weeks next year. With new speedways being built across the country, the want and desire for a Winston Cup race date is immense, and it will only increase. This makes for one incredibly long and exhausting season of racing for the teams. And of course the longer a season is, the more expensive it becomes, to the teams and ultimately to the fans. Looking at solutions, one simple approach would be to eliminate in-season testing altogether. It's possible that NASCAR could learn a lesson from CART in this regard. Testing means more work for the crewmembers. CART recently adopted a new set of rules for testing during the 2001 race season. The new testing regulations eliminate in-season testing for CART teams starting next year. In the off-season, a maximum of 20 days of testing would be allowed for a two-car team. Current rules provide 36 test days per season, of which 20 could be run in-season. Single car teams will be allowed 14 test days, a reduction from 24. Special exceptions will be applied for circumstances such as driver injuries, or special tire or engine tests, which will be managed under the direction of CART. Another important change CART implemented was the elimination of Friday Qualifying. Friday will now be strictly a practice day, with qualifying on Saturday and the race on Sunday. There will be a lot of practice time allotted on Friday for teams to find the right setup. The philosophy behind this is simple - if you bring the whole 'circus' to town for a 3-day weekend, accomplish as much as possible during that time-period, rather than have a team trek out to that same race track a few weeks in advance to work on setup so they are ready to win the pole on Friday of race weekend. CART runs at each venue only once per year, their cars are far more sophisticated to setup, and their cars undergo significant design changes from year-to-year. It is beyond us why a Winston Cup team that visits each venue twice per year, and operates with far less sophisticated equipment than a CART Champ Car, needs to test at all during the race season. If team #1 tests, then team #2 has to test, and so forth. It's a vicious cycle. Why should NASCAR put an end to in season testing? Let's look at the reasons. Multi car teams have a huge advantage over a single car team. Jack Roush has more in-season testing sessions to spread among his teams. You can bet he is testing at many of the tracks during the season and is probably testing more than once on some of them. If you compare this to a single car garage that has to pick and choose it's testing arenas, you will see the term "bigger is better" never held truer. Consider Jeff Burton's convincing win at New Hampshire, then consider that the team tested for two straight days at Nashville with their Restrictor Plate engine to get ready for the event. Most drivers, crewmembers and teams graduate out of the Busch Grand National series to join the Winston Cup tour. A car owner may have a Busch series team to compliment their Winston Cup effort. If so, any weekend can deliver 500 miles of Busch "testing" data to be delivered to the Winston Cup effort. Let's not forget that some of the Winston Cup drivers also drive in the Craftsman Truck and Busch series events, creating additional "testing" opportunities. How much does the technology on the cars change year by year compared to, say, CART? With the strict rules that NASCAR sets on body templates, sheet metal, approved parts and tires, probably not very much. In reality the teams are really working on race setup. Is anybody actually testing some radical new design or part? As tight as NASCAR keeps the reigns on development, very little new equipment/technology is implemented. Therefore, why the need to test so much? No more tire wars to be waged at the track. There was a time when Hoosier would bring a superior tire to the Goodyear offering, and yes, testing made a difference for that. But now there is no Firestone tire to test, no Hoosier radials to run, just the official tire of the Winston Cup tour and what they bring for everyone to run at the track. The fine Goodyear engineers determine the proper stagger and air pressure for everyone to use and the fine-tuning starts from there. Everyone gets the same tire, so no need to spend time testing those. Let's not forget parity. NASCAR routinely mandates rule changes in an effort to make all of the manufacturers cars appear equal on the track. Pontiacs get more spoiler, Fords get a slicker body template, Chevrolet gets, well, maybe they get something, but you understand the point. NASCAR continues to fine-tune the rules in an effort to have a Ford, Chevrolet and Pontiac running in the top three spots every week. With their new system, if CART makes a rules change, they will allow a special test session to see how well it works. NASCAR can do likewise if they change a body template, but only on a special as-needed basis. Another topic that nobody wants to discuss is fatigue! We have had dreadful accidents this year that resulted in terrible loss of life. Everyone had determined that stuck throttles were the culprits, but why did they stick? Were there other problems as well? I am in no way saying the accidents were the result of human error, but I am saying that the equation for human error is increased when you try to perform your job while fatigued. At one race earlier this year I noticed pit crewmembers leaving a store with a pleasant supply of alcohol. My colleague was curious about the amount of beer and asked, "If that was you, would you be drinking the night before a race?" I shrugged it off to "the boys" having a couple of cold ones, but the next day I was not at all surprised when that same pit crew had a lug nut problem during a pit stop costing them 20 or more positions in the race. Coincidence, or was it the burnout/fatigue factor caused by over work and the use of alcohol to relieve the stress? The elimination of testing would close the gap between the 'haves' and the have-nots'. The costs savings per team in equipment, manpower and dollars would be immense. It might cost the owners of multiple car teams a victory or two while giving the single owner cars a more equal footing on which to compete with the established racing programs. Is NASCAR testing itself to death? Is it time to reduce NASCAR Winston Cup testing? Is so much testing really needed? We suggest NASCAR follow CART's lead and eliminate in-season testing and make Friday's a practice/testing day.